The BDR301 featured an SDI-12 intelligent sensor interface, four single-ended (two differential) analog input channels, one switched excitation, one digital output, and two pulse counting channels. It included a sealed enclosure, 32-character alphanumeric display, and RS-232 interface for connection to laptop computer (only data retrieval method). Software support was provided by PC300. The BDR301 required special connectors. The data file format was not compatible with the CR500, CR510, CR10(X), or 21X files. The BDR301 was manufactured from 1991 to 1996. 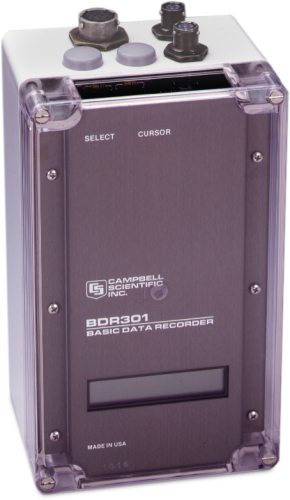 All of the software used with the BDR301 is no longer available. One copy of either PC301 or PC300 was included with each BDR301 purchased. PC301 was an earlier version of PC300. PC301 or PC300 BDR Support Software was used for programming, data retrieval, and interrogation of BDR301 by on-site laptop computer. PC208 DOS Datalogger Support Software supported telecommunications.